One fine morning I wake and fell to have Chitoi Pitha. As my friends and family know, I am very fussy eater. Being a fussy eater make me to learn new recipes every day. So If I fell to have something, I have to have it. But there are some few problems about making chitoi pitha. 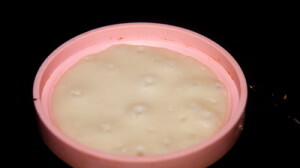 Though very few ingredients need for Chitoi pitha, it needs to cook special clay pan or iron pan which I don’t have. 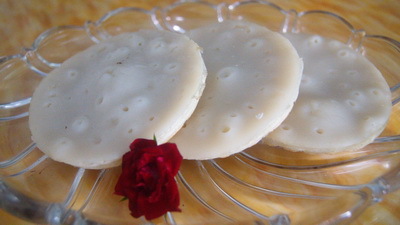 If I had that special Chitoi pitha pan, I am sure that most of my readers don’t have that. So I think about something alternative. I think that non stick pan will do. So I make batter and make pitha. Wait a bit and first 2 become daisy shape because of flat pan. So I use egg ring to make it round. If you have chitoi pitha pan, you don’t need anything else. 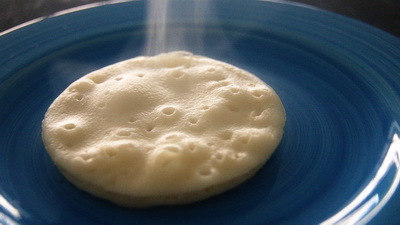 Chitoi pitha is actually like crumpet. I use baking soda here. But soda water makes good chitoi pitha too. If you want to soda water, just swap water with soda water and omit baking soda. Also needs non stick pan with lid and egg ring. Check my smoky hot Chitoi pitha. 1. Make a smooth, runny batter with all ingredients together. 2. Heat pan and when pan is hot, place egg ring. 3. Add 1/3 cup of batter and cook 2.5-3 minutes under closed lid when there should be many tiny holes on the surface. 4. Take out chitoi pitha from and repeat with the remaining batter until used up. 5. Serve Chitoi pitha with molasses and grated coconut or chilli paste (morich bhorta) or meat curry and enjoy the flavour of Bangladesh. Tips: Water could be need more or less. apu..ami adelaide e thaki egg ringta ki plastiker..eta ami kothai pabo…and also many thanks for ur all recipes..
amar egg ringta silicone -er. ami mone hoy kmart theke kinechile few years ago. kintu je kono egg ring-e hoyar kotha. you will get egg ring literally everywhere supermarket, kmart, kitchen shop etc. Thanks. So far the best chitoi pitha receipe. Will try for sure. Then will tell you my experience. Thanks a lot apu. Hi Rownak.thanks for this recipe. Thanks for your recipe.. but the lid u r talking about says it must have many holes… can u pls give us a picture of the lid u used.. i have a cast iron chitoi pitha tava that i brought from my last trip to BD.. but it doesnt come with a lid… and its oval shaped, and i have never seen an oval shaped lid .. anyway i am happy to use a nonstickpan and an egg ring.. but pls guide me with the lid. thanks in advance. how could bring oval shape!!! anyway you can find some oval shape lid in kitchen shop. If you are lucky, you will get your size. I love to shop on-line. You can check in ebay too. Thanks. Apu chitoi pitar recipita ki amake banglay send kora kabe?